Really like it so far! The pills are a little big but I can tell the difference in my body. 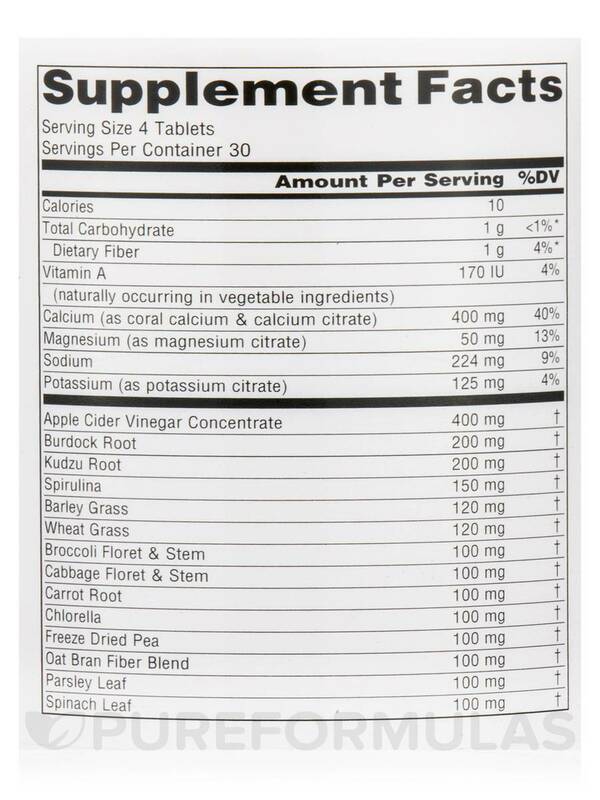 I need to keep my uric acid in balance and this helps a lot. I have been using it for five years and I keep ordering it whenever it runs out. 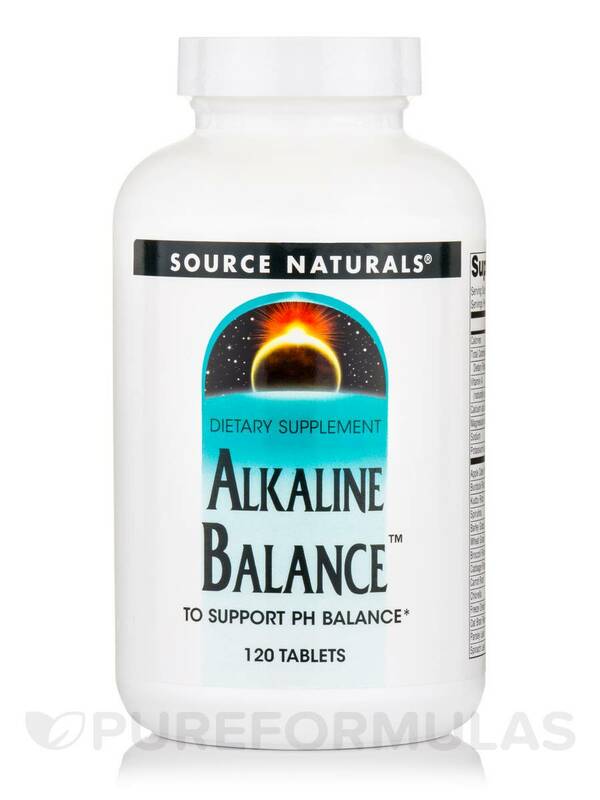 These Alka – Balance™ 120 Tablets from Source Naturals may possibly support normal alkalinity in your body along with potentially promoting your general health and wellness. Diets that are high in refined sugar‚ meat‚ and processed food can potentially cause more harm than good by increasing the acid levels in the body. In these modern times our body is exposed to such food in abundance and high acidic levels in the body can potentially hinder our wellness. 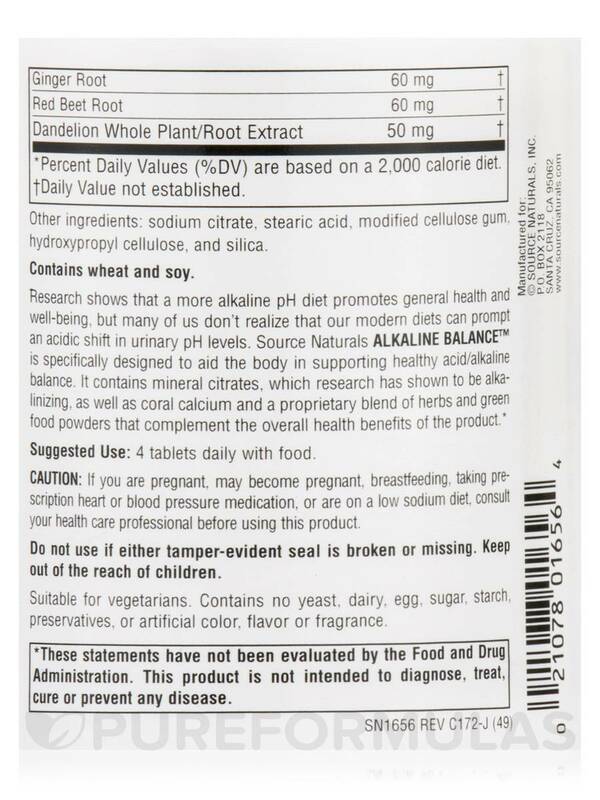 That’s why Source Naturals’ Alka – Balance Tablets are formulated to potentially maintain your body’s normal alkalinity. Certain studies claim that a good pH balance in the body may possibly also assist in maintaining normal weight and cell function. This Source Natural supplement contains apple cider vinegar concentrate‚ which is said to possibly have a cleansing effect on the body while also regulating acid/alkaline balance in the body. The dietary formula also contain green food powders like the Spirulina and Chlorella powders that may help in boosting your body with antioxidant properties along with maintaining a healthy digestive system. 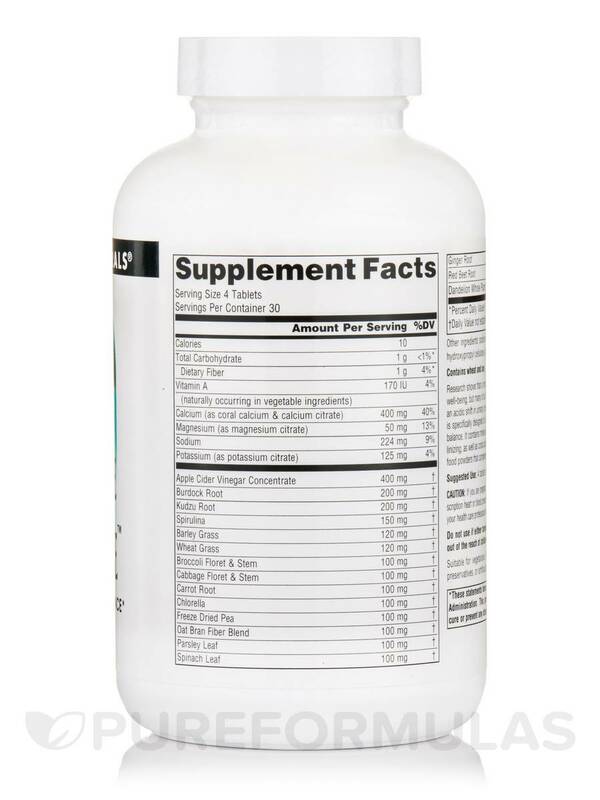 The Source Naturals supplement also contains coral calcium‚ which is considered to be beneficial for the functioning and the maintenance of bones. 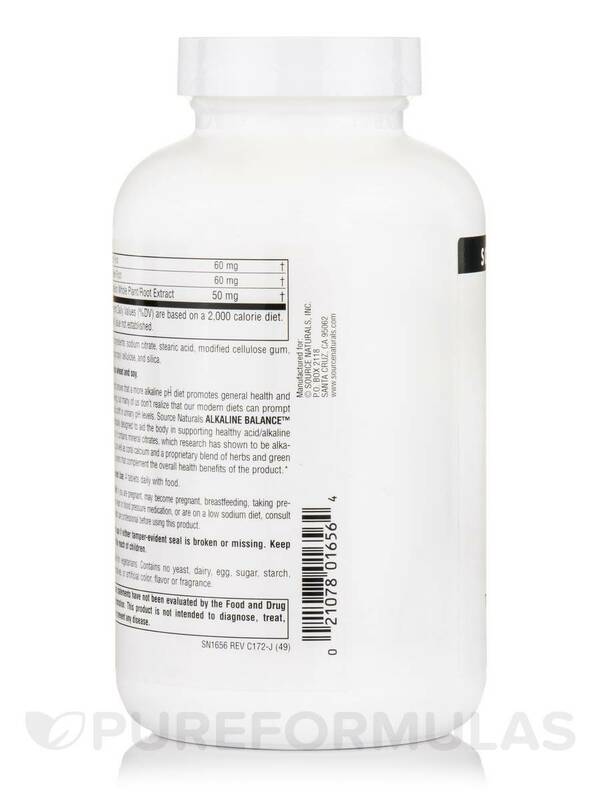 Alka – Balance™ 120 Tablets from Source Naturals contains the goodness of alkaline mineral citrates‚ a host of herbs‚ calcium and green food powder‚ which may comprehensive benefits for your health and wellness. 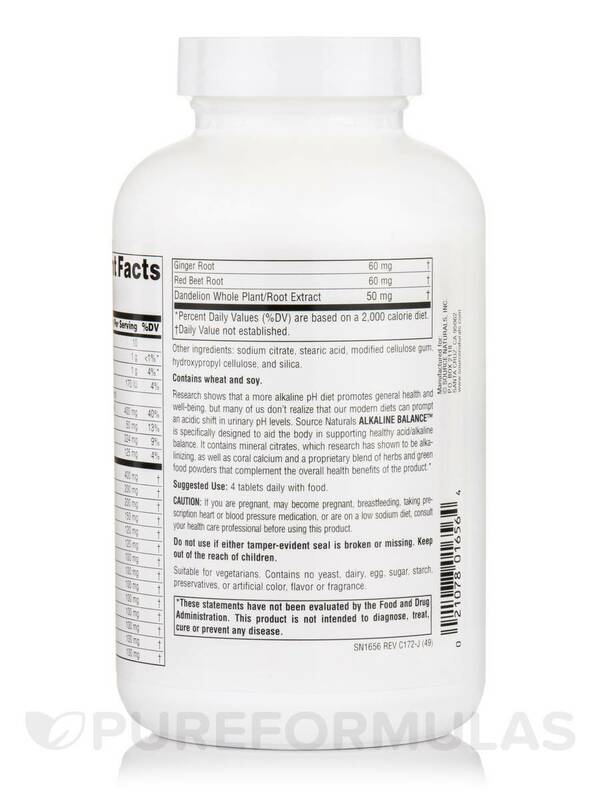 Other Ingredients: Sodium citrate‚ stearic acid‚ modified cellulose gum‚ hydroxypropyl cellulose‚ and silica. Contains no yeast‚ dairy‚ egg‚ sugar‚ starch‚ preservatives‚ or artificial colors‚ flavor or fragrance. If you are pregnant‚ may become pregnant‚ breastfeeding‚ taking prescription heart or blood pressure medication‚ or are on a low sodium diet‚ consult your healthcare professional before using this product. Best product in the market, I use Alka Balance by Source Naturals morning and night to keep my alkaline balance. Last test was 8.0 very good. No problems with acidity or reflux. I like the product is very good. Purchased Alka Balance by Source Naturals to add more alkalinity to my diet for times that I'm on the road or out of fresh veggies. I have a bit of a hard time swallowing them sometimes are they are long. I bite them in half taste fine and that makes them easy to swallow. Quality ingredients! Taste is pleasant! Difficult for me to swallow, have to bite in half. Balanced ph = balanced life! Alka - Balance is one of those products that it is hard to really judge if it is doing anything unless you are using an acid testing kit which I am not. I am taking Alka - Balance because as a bodybuilder I consume large amounts of protein which I understand can lead to excess acidity. I do feel taking Alka - Balance for the past month so far has given me a greater sense of well-being but of course this is subjective. I wouldnt say I actually feel any definitive effects from this other than on the suggestion of my brother who has been taking Alka - Balance for a year I break up the dose of 4 tablets into 4 separate times a day. Otherwise I find that it seems to cause cramps for some reason. Too much uric acid in your system? Sometimes it is out of stock.